Nationwide Series new car debuts at Richmond test Walking through the garage on Monday at Richmond International Raceway prior to the start of the first official test session for the Nationwide Series' new car, series director Joe Balash was told he looked like a "proud papa." "This is a new project for the Nationwide Series so there's an unknown until you get [the car] to the racetrack," Balash said. "Now we have it at the track and it's been very well-received." The four series manufacturers — Chevrolet, Dodge, Ford and Toyota — were represented by five teams. Bryan Clauson was the first driver to take a lap for Dodge and Chip Ganassi Racing. David Ragan and reigning series champion Carl Edwards for Ford and Roush Fenway Racing; David Reutimann for Toyota; Scott Wimmer for Chevrolet and Richard Childress Racing, the defending series owner champion; and Morgan Shepherd for Davis Motorsports also turned laps throughout the day. "Going through the garage area and speaking to some of the drivers, the input I got was the car was very good," said Robin Pemberton, NASCAR's vice president of competition. "A couple actually said they wished they could race this new car tomorrow." Differentiation and uniqueness are the name of the game going forward with the introduction of the new car in the Nationwide Series. The main difference between the current car and the new car will be the chassis and the body. The current chassis has a 105 inch wheel base. The new car will be a 110 inch NASCAR-certified chassis, which is the same as the current Sprint Cup car. This also will allow current Nationwide Series components to be brought forward in an effort to contain costs. The new car will provide the same safety enhancements that are in place on the current Cup car and will also make more bolt-on parts interchangeable (for example, rear end housing), creating cost savings for the teams. Additionally, the new car will continue to use the rear spoiler whereas the Cup car has a wing. "We're still walking down the path of certifying the bodies for the cars in the Nationwide Series," Balash said. "The manufacturers haven't made their official announcements yet on what body styles they'll have once we get to the race track." Cost containment and competitive balance also are keys for the introduction of the new car in the Nationwide Series. "As we build cars, we want to make sure we don't draw something up on the drawing board that's hard to manufacture," said Brett Bodine, NASCAR's director of cost research. "If that's the case, the cost goes up to produce these cars. As they build these cars — these are the first ones built — we're listening to what they've got to say from their fab shops. This is the kind of interaction from a small group of people like we have here today that helps makes the process a lot more efficient." "So far we've been pleased," team owner Johnny Davis said. "With more testing, we can be pretty close [to the multi-car teams]. I think a smaller, single-car team under these circumstances can be a better top-10 car than what we have today with our current cars." The drivers at the test also gave the new car a thumbs-up. "I'm excited about the car," Wimmer said. "[There are] a lot of real positive things right now. We've been running through the normal things we do at a test and it's responding well." "The car's been good and it looks pretty cool, too," Edwards said. "I was impressed. I hadn't seen the car before it was sitting on the ground. It drives really well; it feels a lot like the cars we're driving right now. Compared to when we first ran the new car in the Cup Series this is a lot smaller change for us. I'm happy with it." Tuesday's second day of testing has been re-scheduled for a morning-only session since the data gathered Monday by the manufacturers and teams was sufficient. The threat of rain in the afternoon also was a factor. 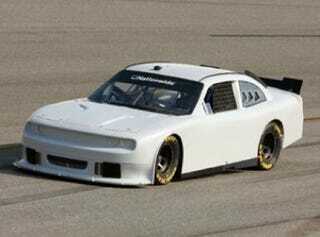 The Nationwide Series new car is also set to test Oct. 13-14 at Charlotte.